Selling your product requires patience and hard work, but it also needs an excellent platform for you to be able to to make that sale. With Sellbrite, it’ll be easier for you to list and sell your products on the world’s largest online marketplaces. Now you can manage and control any order which can help you build your multichannel e-commerce businesses. It all began in 2008 where Brian Nolan and Mike Ugino, co-founders of Sellbrite, met at a top-200 online retailer. They are both working hard on their fields, Mike working with vendors to find new, creative ways to sell through more inventory and Brian, who was leading the multi-channel initiative and expanding their sales to eBay, Amazon, Sears and other Marketplaces. It was then that these guys realized two things: that it is critical for the success of e-commerce to sell on multiple channels and there’s no easy solution to help with this that people loved using. They thought that it is time for a new and better solution that is affordable, time to help people achieve their multi-channel business goals in a more personable and empathetic way. Hence, in 2014, Sellbrite was born, paving the way for people to achieve success in the e-commerce business. Now, Sellbrite is the number one intuitive platform that empowers sellers to list and manage their products on numerous online channels, such as Amazon, eBay, Shopify, and Bigcommerce to name a few. Aside from being super simple to use, Sellbrite has a lot of features and services that you can use to help you be efficient in managing your business. With a few clicks, you can now see where your inventory is currently selling and create new product listings out to your sales channel in volume. Sellbrite helps you save hours of work, and the best part is that it takes out the risk of increasing to a new marketplace. You can select the products that you want to list, choose the channel to list it on, and Sellbrite will create the perfect listings for you in real time. If you’re going to sell for different prices in other channels, that’ll be no problem at all. You can customize your products for each channel as you see fit. It’s that simple! 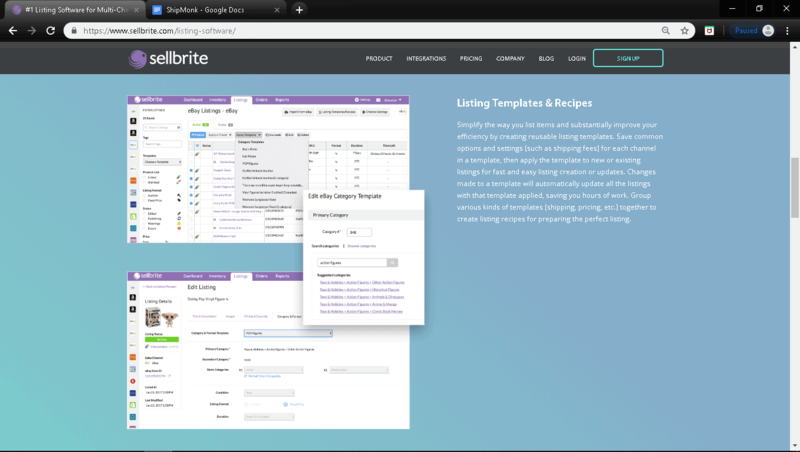 With Sellbrite, you can simplify the way that you list your items and improve your efficiency by creating reusable listing templates. You can now save common options and settings such as shipping fees, for each channel in a template; then you can apply the model to an existing or new listing automatically updating all the listings with that template applied. You can create high converting eBay listings and gain an advantage on your competition by using custom HTML in your listing descriptions. Sellbrite, powered by CrazyLister, offers a simple drag-and-drop interface, easily creating professional, mobile-optimized eBay listings that are 100% compliant with eBay’s active content policy. 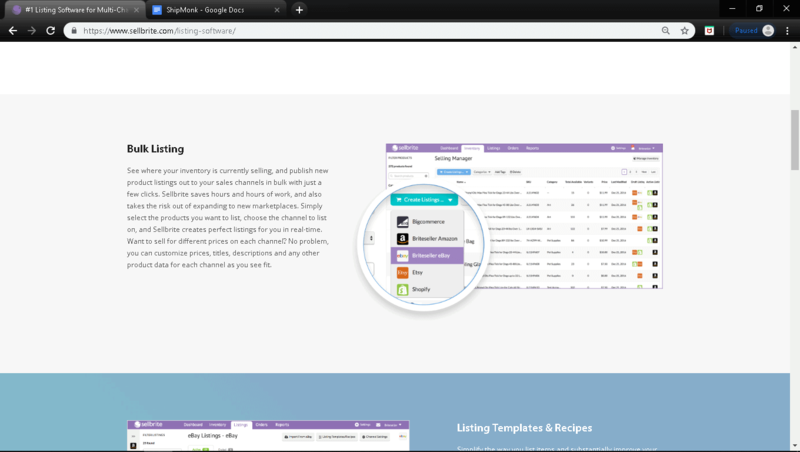 Alternatively, you can enter your HTML and insert product tags to merge your product data into your template. Sellbrite’s robust listing tool has you covered! All of your products options or variations are now rolled up into one listing, creating an improved and enhanced buyer shopping experience, helping you save on listing fees. Category based item specifics, such as Storage Capacity and Service Provider for smartphones, plus custom items specifics, provides buyers searchable and easy to identify details about the products listed. Sellbrite fully supports item specifics, and you can map it to any custom attributes in your inventory. Being the leading online marketplace in the U.S. and accounts for millions of dollars in orders every week for Sellbrite sellers. Offering more categories compared to other markets, Sellbrite’s best-in-class eBay integration gives sellers the maximum flexibility in providing their products. It is with utmost pride that Sellbrite is the first third-party software to list into Etsy, the leading marketplace for craft and vintage merchandise. The largest retailer in the world with millions of unique visitors shop on Walmart.com every month, meaning more chances for your product to sell with Sellbrite’s integration. A leading global retailer of home merchandise, automotive products, and apparel. The next generation marketplace, Jet, focuses on transparency, value, and control for both shoppers and retailers. This marketplace is very particular among the tech-minded online shoppers, making Newegg one of the most trusted shopping destinations in the world. Building your online store has never been this easy with Shopify, and with Sellbrite, you’ll have no worries to leverage that store on more channels. Shopify Plus is an enterprise e-commerce platform and solution for high-volume and fast-growing merchants. It is a scalable e-commerce solution for sellers of all sizes. Sellbrite and BigCommerce forms a powerful combination for multi-channel selling. A simple e-commerce plugin for any WordPress website. With Sellbrite, you can seamlessly connect to WooCommerce for that seamless multi-channel expansion. With Sellbrite partnering to the leading shipping services, your product will reach all consumers without any issues. Sellbrite’s do not settle for less but with the best. Being partnered with leading developers and e-commerce agency, helping you and other merchants maximize their sales and helping you succeed. You can also start your free 14-day trial with them before subscribing to any program of your choice. With Sellbrite, you can quickly achieve success in the e-commerce business, in an affordable and efficient software to help you with your products. With its user-friendly interface, you can sync all of your inventories across multiple marketplaces. With excellent customer service and a great team, you won’t regret choosing Sellbrite. Visit their page and don’t forget to sign-up! Sellbrite: The Leading Multi-Channel Solution for Brands and Retailers Overall rating: 0 out of 5 based on 0 reviews.